The first time I heard the name “Jonathan Edwards” was at a conference. I was a young guy in college and my mentor and pastor-at-the-time had encouraged me to attend the Desiring God National Conference in Minneapolis. For some strange reason I said I would go, and it just so happened that the year I went was the 300th birthday of Jonathan Edwards. I knew nothing about the 17th century American Puritan pastor. In fact I knew nothing about the speakers who would be telling me about Jonathan Edwards. I had never heard of J.I. Packer, Iain Murray, or John Piper. Yet I went to this national conference, and was amazed. When I returned home I immediately decided I was going to read more about Edwards. By the summer I had read a handful of books on the man and his theology, but still nothing by the theologian himself. So, as a summer intern at another local church out-of-town, I raided my bosses library and found a copy of this very book. I was determined to work through it that summer and come to see first hand the beauty of Edwards’ work. This book, however, did far more than that. The End for Which God Created the World exposes readers to the bigness of God. I had never read anything like this. Even in all my newly developing theological studies The End was in a separate category of works. The language was sometimes dense and highly philosophical. I had to read sentences slowly and sometimes multiple times through just to get the full depth of the meaning. I was particularly struck by Edwards’ discussion of the relationship between love, duty, and joy. The idea that it is my duty and obligation to delight myself in the Lord was mind-blowing. More mind-blowing, however, was the suggestion by Edwards that God himself had a duty to love and delight in himself. The whole work exposed to me a God much bigger than the one I had crafted in my mind. God was highly complex, beautiful, majestic, and far-surpassing the simple deity/creator to which I had reduced Him. Edwards’ theology was enamored with the greatness of God. It was rich and full. I had, by that time in my studies, become familiar with pop-theology, full as it is with reductionisms and simplistic explanations of significant theological truths. Edwards blew a whole in my tiny theological box, and opened up a world of deep thinking and challenging mental effort. If MacArthur’s book had exposed the shallowness of my ecclesiology at the time, it was Edwards who exposed the shallowness of my overall theology. I needed this book not simply for its immediate content, but for its overwhelming benefit to my theological development. The book focuses on the question: why did God create the world? Early on Jonathan Edwards had established that God created the world for the happiness of people. Later he saw that the Scriptures taught that God created the world “for his own sake.” In his masterful theological work on the subject, however, Edwards realized that those two ideas were actually deeply related and subsumed under the idea of God’s self-communication. 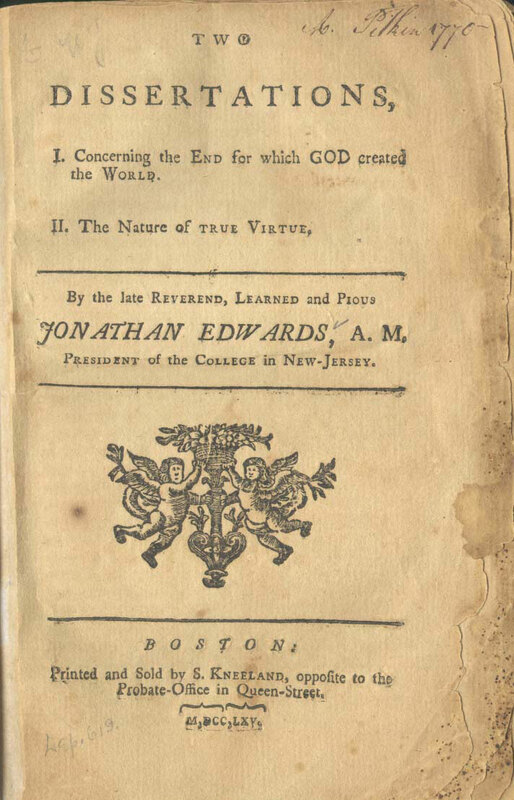 In The End for Which God Created the World Jonathan Edwards presents readers with a balanced doctrine of God. Edwards is a poetic theologian for sure. His use of metaphor and analogy, his moving descriptions of the glory of God all bring life and vitality to his doctrinal expositions. So God’s communication of himself is like a tree “which puts forth buds, shoots out branches, and brings forth leaves and fruit.” It’s like a fountain so full it can’t help but overflow. Edwards delights in this God, and more than abstract theology he is speaking of a being he knows and cherishes. That’s what often makes the presentation in this work so compelling. Edwards is certainly thorough in his logic, and often the flow of his thought can be overwhelming. Yet the beauty laced throughout it makes it worth the effort it requires to read it. For those willing to do the hard work The End will reveal a unique answer to the question of God’s motivation to create. According to Edwards, it is because God delights in the communication of himself that he determined to create the world. God pours forth his glory in the creation of the world and the creation receives that glory. There is a sense in which Edwards work here is an extended meditation on the first question of The Westminster Catechism. “What is the chief end of man?” The question asks. And it answers by saying “to glorify God and enjoy him forever.” So the creation of the world is both the glorification of God and the enjoyment of his glory by his people. While it is not necessarily a unique theology – though I would argue Edwards developed it quite differently than any of his predecessors – the concept was mind-blowing to me. I had never encountered a God so big and a joy so deep. The God depicted in The End reveals a God both transcendent and immanent. This is a balanced doctrine of God much-needed in our cultural climate today. This God is both above creation, needing nothing from it, and yet highly involved in it. His creation proves his transcendence and yet viewing His creation as the communication of himself promotes a God of love and investment. A lot of theological investigations tend towards one extreme or the other. Traditional Reformed communities can sometimes emphasize the transcendence of God in unhealthy ways, and more Emerging theologies can swallow up transcendence altogether. I love this work. It is compelling, unique, and inspiring. It made God’s greatness and theologies riches come alive for me. The End steered me away from the surface-level theology that I was growing accustomed to and propelled me deeper into the works of great minds. The End propelled me into my own deep thoughts about this amazingly big God.